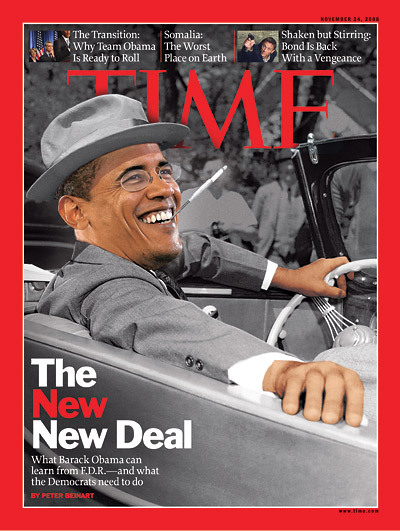 Progressives are disappointed that - contrary to the hype - Obama is no FDR. But FDR himself wasn't who we think of as FDR until he was forced by protests, strikes and other forms of civil disobedience. Voting ... is a poor substitute for democracy, which requires direct action by concerned citizens. The obstacles are a kind of resignation that things will go on as before. That's always the obstacle to change. The obstacle to change is not that people don't want change. People want change. But most of the time, people feel impotent. However, at certain points in history, the energy level of people, the indignation level of people rises. And at that point it becomes possible for people to organize and to agitate and to educate one another, and to create an atmosphere in which the government must do something. I'm thinking of the 1930s; I'm thinking of Franklin D. Roosevelt coming into office not really a crusader. Roosevelt came into office, you know, with a balance-the-budgets history. It was not clear what he was going to do, and I don't think he was clear about what he was going to do, except that he was going to be different from Hoover and the Republicans. But when he came into office, he faced a country that was on strike. He faced general strikes in San Francisco in Minneapolis. He faced strikes of hundreds of thousands of textile workers in the South. He faced a tenants movement and an unemployed council movement. And he faced a country in turmoil, and he reacted to it, he was sensitive to it, he moved. That's what we will need. We will need to see some of the scenes that we saw in the '30s. In his recent book Nothing to Fear: FDR's Inner Circle and the Hundred Days That Created Modern America, Adam Cohen [assistant editorial page editor of the New York Times] points out that when FDR was elected in November 1932, and even after he took office in March 1933, his ideas about what to do were very unclear. He promised Americans a "New Deal," but he had very few specifics. In fact, FDR was in many ways a cautious, even conservative, politician. The one clear idea he had in mind when he took office was to cut the federal budget, and the person he hired to do that job was his budget director, a conservative Congressman from Arizona named Lewis Douglas. He was also initially reluctant to use the power of government to regulate business practices, create jobs or to support union organizing or struggling farmers. He was clear from the beginning, however, that core values were at stake--articulated in his first Inaugural Address. That is what created the ground--and support--for his pragmatic experimentation. Cohen's book describes an ongoing battle for FDR's heart and mind that took place both inside and outside the White House. As Cohen recounts, "Farmers who stayed on the land were responding to their bleak circumstances with extreme politics and lawlessness." Across the Farm Belt, hundreds of farmers would show up and stop a foreclosure sale by the force of numbers. Some farmers threatened to call a national strike if Congress didn't act. In Sioux City, Iowa, farmers put wooden planks with nails on the highways to block agricultural deliveries. Cohen writes that in Nebraska, a group of farmers "showed up at a foreclosure sale and saw to it that every item that had been seized from a farmer's widow sold for five cents, leaving the bank with a total settlement of just $5.35." These protests by farmers, Cohen explains, "increased the sense of urgency in Washington." Henry Wallace and progressive Democrats in Congress kept FDR aware of these protests, which helped them outmaneuver their more moderate colleagues. This combination of outside protest and inside maneuvering led to passage of the Agricultural Adjustment Act and the Emergency Farm Mortgage Act, which, Cohen says, "radically changed the economics of American farming." After FDR took office, the veterans returned to Washington. In contrast to Hoover, FDR invited the Bonus Marchers to camp at a nearby Army fort and provided them with meals, medical care and entertainment by the Navy band. First Lady Eleanor Roosevelt visited the veterans and listened to their complaints. FDR didn't restore their bonuses, but he did issue an executive order setting aside 25,000 places for veterans in the Civilian Conservation Corps, the first of the New Deal public works programs. In the 1930s, the United States was a nation of renters. As the Depression worsened, there were huge waves of evictions, because tenants didn't have the income to pay rent. Utility companies shut off electricity and heat. In many cities, when word spread that a family was being evicted, a crowd would gather--sometimes ten people, sometimes a few hundred. The police would remove the furniture from the house and put it out in the street, and the crowd would bring the furniture back. This happened so often that some police officers would refuse to evict or arrest people. These protests set the stage for the New Deal's housing programs, the first time that the government provided subsidies to create affordable housing. In January 1933, several hundred jobless Americans surrounded a restaurant just off Union Square in New York City, demanding that they be fed without charge. In Seattle in February 1933, about 5,000 unemployed people occupied the County-City Building demanding jobs or relief. These and similar protests around the country set the stage for the nation's first cash assistance program for struggling families. Through the 1930s, workers engaged in massive and illegal strikes and sit-down protests in factories and retail stores throughout the country. In 1934, 1.5 million workers--including longshoremen, teamsters, factory workers and retail clerks--went on strike. In San Francisco, 130,000 workers joined a general strike. FDR was initially ambivalent about protest and about radicals. For example .... FDR wasn't enthusiastic about the mounting protests by farmers, workers, veterans, community groups and the advocates of the Townsend Plan (for old-age insurance), but he understood their utility. FDR once met with a group of activists who sought his support for legislation. He listened to their arguments for some time and then said, "You've convinced me. Now go out and make me do it." Many of my friends have been puzzled that I have not been a strong critic of the Tea Party. Indeed, quite the opposite, I stand as a critical admirer.... I am a genuine admirer of the urge to reform that is at the heart of the grassroots part of this, perhaps the most important political movement in the current political context. My admiration for this movement grew yesterday, as at least the Patriots flavor of the Tea Party movement announced its first fight with (at least some) Republicans. The Tea Party Patriots have called for a GOP moratorium on "earmarks." Earmarks are ... an essential element in the corruption that is Congress today.... they have become the key to an incredible economy of influence that effectively enables lobbyists to auction too many policy decisions to the highest special interest bidder. That economy won't change simply by eliminating earmarks. But eliminating earmarks is an essential first step to starving this Republic-destroying beast. We do face a common enemy. Special-interest-government is anathema to both the true Right and the limping Left. Progress would be to work together to end it. As I've previously pointed out, progressives such as Dave Lindorff, economist Dean Baker, Daniel Ellsberg, Jonathan Capehart and many others say that we should be emulating the protest energy of the Tea Party, because we have to raise some hell before anything will change. In fact, as I've repeatedly noted, the whole left-versus-right thing is just a distraction trick. It's really the American people versus the giant bankers, captains of the military-industrial complex, and handful of others who are benefiting by shafting the average American. Remember that one of the founders of the Tea Party - Karl Denninger - has slammed the current Tea Party (which was quickly co-opted by the mainstream GOP) for serving the rich and the Republican party instead of fighting against the giant banks, and is calling for non-partisan, Gandhi-style nonviolent resistance to take on the banskters. And remember that "liberal" George Soros is paying a top aide to "conservative" Sarah Palin. Of course, some have argued that there are more effective methods of disobedience than protests and strikes such as this or this. I will leave strategy to those who have better tactical sense than I have. But one thing is for sure: unless we make the lives of those in power a little more uncomfortable, nothing will change. Note to conservatives who dislike FDR: Glass-Steagall and other regulations against fraud wouldn't have been passed unless the public had raised hell through protests and strikes. Postscript: Yves Smith is having none of it, pointing me to an article by political science professor and Roosevelt Institute Senior Fellow Thomas Ferguson which saying that FDR never worked for the status quo, and concluding that "FDR was simply not willing to make the kind of arrangements with bankers that President Obama was". Quoting Howard Zinn on history is like quoting Barry Obama on the law. It's silly. Paul: it's an order of magnitude less silly than quoting Ayn Rand on economics. Zinn certainly examined history from a different point of view than most, and that is what made him great. Is there something factually inaccurate about those quotes? FDR himself told a group "I agree with you, I want to do it, now make me do it." Corey, I was unaware that Ayn Rand fancied herself an economist. Zinn wrote a United States history book where he basically just wrote "NOT" before every fact we have always known about the United States. I guess calling that a different perspective is one way to look at it. Calling it intellectually dishonest is a better way to look at it in my opinion. "Free Trade" is as freeing as the "Patriot Act" is patriotic! It only serves to profit globalist finance oligarchs and impoverish American workers who are forced to compete with third world sweatshops. FDR's New Deal dirigiste policies are the true and ONLY representation of American System traditionalism. Check out TARPLEY.net. Webster Tarpley is a leading authority on both FDR and the true nature of his economic policies. Paul did you ever stop to think that maybe most of the "facts we always knew about the United States" ARE wrong? At least recognize that what you were taught in school was, for the most part, a complete farce. Especially the parts involving Native Americans. Also, perhaps Ayn Rand was a bad example. I should instead have used her chief disciple and mass-murderer-by-proxy Milton Friedman. Corey, WE prefer to be called Indians. Why do liberals always think they know best for everyone? Just so you know, my grandfather walked off the reservation when he was thirteen. Zinn's was an idiotic perversion of events, and not only with the Indians. Seriously, you must have not read Zinn's "history" book. I'm dying for some details about what he got wrong. Since your ancestors were very nearly eradicated from the Earth, maybe you could start there. Hang on, I might be confusing Zinn's "perversion" with what actually happened. Indians were nearly eradicated from the Earth? Wow, you really DON'T know what you are talking about. Enlighten me then. I have asked twice for you to cite specific historical inaccuracies regarding FDR or any of Zinn's writing. Until you do, it will appear that YOU are the one with no idea what you are talking about. My last comment was a response to your statement that my ancestors were nearly eradicated from the Earth. Which is silly. Zinn places that fault of nearly an 80% Indian population reduction directly at the feet of the Europeans. He determines that it was intentional, too. Since in the 15th and 16th century, the world at large was still under the impression that the Earth was freaking flat, one could have a tendency to realize that maybe those very same people really did not have any clue how to control sickness or disease. That whole throwing pots of turds in the roads kinda makes you see that. But, since there were four known plague outbreaks in Europe at about the same time, oh well, maybe Zinn's self loathing was misplaced? One thing about the assumptions that are made in this post. Did it ever occur to anyone at all to look at the successes of liberal big government policies without trying to find a certain outcome? Can anyone find any liberal successes? And what Zinn deliberately ignores in his push for Socialism or Communism, is that his way of delivering the falsehoods cover up exactly what happens directly following the public uprising. Hitler, Lenin, Castro, Chavez, Obama. Yes, they are all the same, they remove individual freedoms and reinstate slavery. And the population that first performed the uprising, are the first to be killed to regain control. Hence, in which demographic is unemployment and poverty the highest? Obamabots. But, that is just liberalism, y'all accept it as FEATURE CREEP. One major difference that i see between FDR and Obama would be the ability for the United States to produce something other than money. It seems to me that our manufacturing base has been so severly depleted that the only production in this country comes from the printing press. As long as this is a fact, policy choices won't really make a difference because we don't have an ability for people to get jobs or to trade with other countries. Who really cares about workers going on strike if there was never any intention for them to do work in the first place? Unemployment lines cannot be picket lines. Wars and depressions are planned. Depression era survivors knew FDR. They watched him build up the CCC as America's brownshirts preparatory to WWII conscription. He knew war was coming and lied about his desire otherwise. FDR knowingly arranged the mass slaughter at Pearl Harbor for his day of infamy. Even your vets know it now.